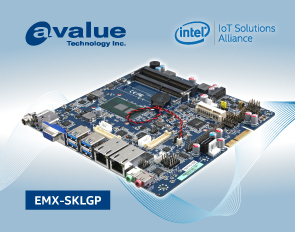 TAIPEI, TAIWAN, July 17, 2018 – Avalue Technology Inc. TAIEX: 3479-TW), a global industrial PC solution provider and an associate member of the Intel® Internet of Things Solutions Alliance, is unveiling EMX-SKLGP, based on Intel® 6th Generation Core™ and Celeron® Processors. EMX-SKLGP, a Thin Mini ITX board with 6th Gen Intel® Core™ i3/i5/i7 and Celeron® SoC Processor, the new range covers a full spectrum of the Intel processor from Core™ i7 to Celeron®, which is "up to 10% faster" and offering graphics that are "up to 34% faster" than the previous generation. EMX-SKLGP not only takes its advantage of the low-power TDPs which are kept within the range from a minimum of 7.5W up to a maximum of 15W, it offers three independent except VGA and HDMI, 2 dual-channel LVDS by 2 Chrontel CH7511 in the resolution of 1920*1080, support customers’ demand in gaming, POS, and kiosk markets. Additionally, EMX-SKLGP provides more flexibilities and expansions as below, making it an ideal solution for versatile industrial applications. PCIe x 4 Gold Finger offers 1 x SMBUS, 4 x PCIe x 1 or 1 x PCIe x 4, 1 x SATA III, and 1 x USB 2.0. The customers can either design their own daughter board easily, or transform the form factor into by connecting with a Riser card. Gold Finger module - 1 x PCIe x 1, 2 x PCI, 1 x USB 2.0, 1 x SATA III in a Fanless Slot PC. IET module – dual LAN, 2 x USB 2.0, and 1 x 16-bit GPIO in a Fanless BOX PC. 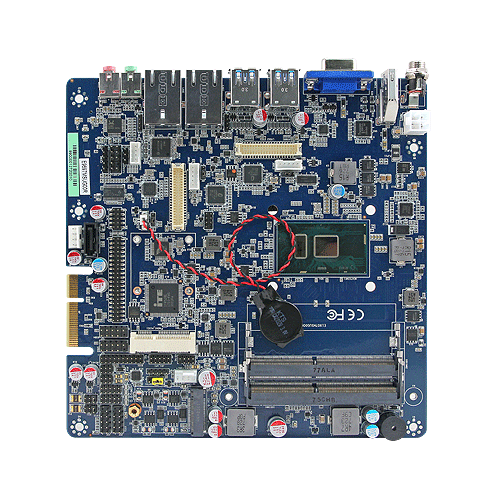 For more information the thin mini-ITX motherboard, please visit our website at www.avalue.com.tw, or contact with sales@avalue.com.tw for more details.